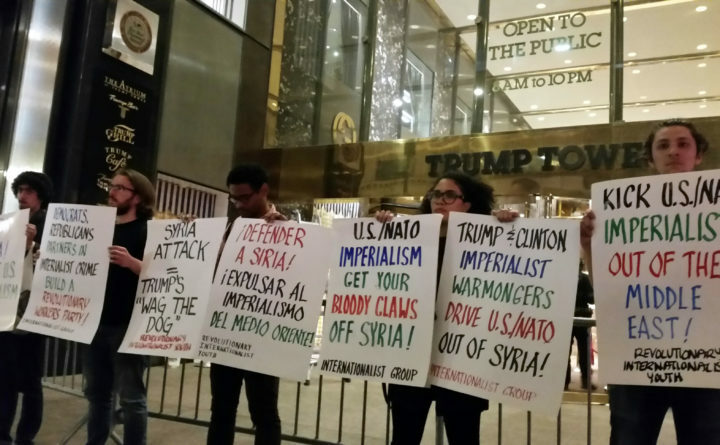 Internationalists protest outside Trump Tower against military strikes in Syria, late Friday, April 13, 2018, in New York. The consensus of most early readers was that the book amplified little in the legal sense, but there were other morsels to chew over regarding Trump’s ethics, such as immediately trying to figure out how to spin the information Comey had just delivered about Russian interference with the election, and his being “untethered to truth.” A few off-hand observations about the president’s appearance — “shorter than he seemed on a debate stage,” white circles under his eyes suggesting tanning goggles, and an over-long tie — were surely intended to get under the president’s skin. So much for the long-awaited tell-all. Then came Saturday. The United States, acting in concert with Britain and France, fired cruise missiles at three sites linked to Syria’s chemical weapons program. Russia had earlier promised to counterattack American interests should the United States attack Syria in response to the Assad regime’s reported chemical attack April 7 in Douma, which was said to have killed dozens of civilians, including children, but there was no immediate indication of escalation, at least. Russia implausibly insists the chemical attack was staged by Britain. No one really thinks that, though, and Trump advisers argued that now was the time to act definitively and dust off our shock-and-awe manual.